Zeva is a 2 yr old spunky red head that will quickly melt your heart. 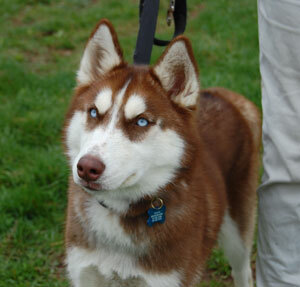 This stunning girl has a wonderful temperament and is eager to learn. She responds well to new situations with her curiosity leading the way. She has a wonderful, sweet spirit and is destined for a bright future. Zeva is crate trained, housebroken, and is in the process of learning some manners. She will do best in a home with a canine playmate of similar size and energy level (she plays hard!) or a family that can offer her an active lifestyle with plenty of exercise. At the end of the day she’s content sharing the sofa with you and just wants to be loved. This little girl will thrive in a home that will enjoy her energy and zest for life, and will provide the training and consistency that she will need.